Ok, so bats are a really important part of the ecosystem and should never be harmed. Bats are our friends. Don't handle bats! If you ever wake up with bats in your room, you should consider that you have been bitten, even if you don't find a bite mark. Go to the hospital ASAP. mrgrtt123 wrote: Now, I feel kinda worried whenever I visit an underground river and there are some bats living in the caves. I've have gone through phases of hypochondria when being in caves, but there's no reason for it. Caves are natural homes for bats. The actual number of bats that harbor rabies, I once read, is about 1/2 of a one percent. Pretty small. But if you see bats in the daylight or out of their normal environment--LIKE YOUR BEDROOM--you should instantly become wary. Just because the bats are not nipping at you, it doesn't mean that you are totally safe. One old friend of mine had been a show cave guide, and he died of histoplasmosis. That is a respiratory disease related to guano. bobby49 wrote: Just because the bats are not nipping at you, it doesn't mean that you are totally safe. One old friend of mine had been a show cave guide, and he died of histoplasmosis. That is a respiratory disease related to guano. Sorry to hear about your friend.That is definitely not a common occurrence with histo though. 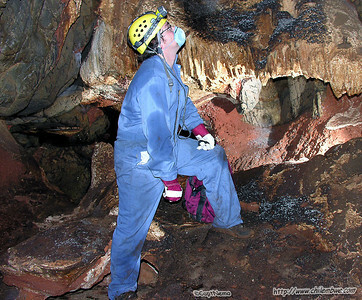 A great many cavers have probably had it and not even realized it since normally the symptoms are similar to the flu. Who hasn't been a little fatigued and achy after a hard week caving? Most serious cases I have read about actually occurred in places like New York city where the fungal spores were traced to pigeon droppings on building rooftops. That said though we did visit a cave with known histoplasmosis contagion in Botswana. The local geologist who lead us to the cave declined to enter with us since he had previously contracted histo from the cave. There was a large bat colony which was the source. None of our party contracted it though. I believe in part because it was unusually wet. (the spores become airborne when dry and disturbed) and because we took care to wear dust masks. My brother-in-law got a serious case of histo from a chicken farm in Indiana a long number of years ago. It's not just caves, though midwestern caves can be a source. As I grew up caving in Iowa, it wouldn't surprise me if I hadn't gotten it, too, and not known. I am curious if there is any theory as to how he did contract the disease, given that (according to him and his wife) they were never actually bit by any of the bats. Perhaps just through contact with the bat's saliva? I have no memory of where I read it, but I know I read it somewhere reputable. That if you wake up and find a bat in your room, you should consider that you might have been bitten. The article says they did wake up to find a bat in their bedroom. Bats are mighty gentle in their biting. You shouldn't expect to be woken by a bite. If there is bat saliva on your skin surface, it isn't too hard to imagine that getting into your mouth or elsewhere.